Welcome to Schillingen in the midst of the nature reserve Saar-Hunsrück! A paradise for the nature lover where you will never be bored. The nature reserve offers you the opportunity for your individual leisure activities in every season. Whether you walk by meadows and woods or create balance and rest while fishing. In addition, you will be able to find other amenities which you can expect from a modern recreation area. For example swimming, horse riding, cycling, hiking, barefoot trail, cross-country skiing, ice skating and a lot more in Schillingen and immediate surroundings. The central location offers you the possibility to do excursions to the neighboring countries of Luxembourg and France, to the wine valley of the Mosel, the Saar and Ruwer, to the town of Idar-Oberstein (famous for its gemstones) or to the oldest town of Germany, Roman Trier. Not far from the Schillinger See (Lake) and barefoot trail. Well maintained appartment with approx. 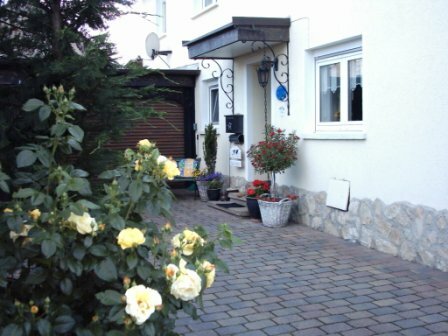 70 square meters, cosy and furnished for comfort, sleeps 4, 2 bedrooms, sitting room, kitchen-living room well equipped, bath with shower. Separate entrance, parking, patio, BBQ . Equipped with: fridge/freezer, stove with oven, microwave, coffeemaker, egg cooker, toaster, grill oven, TV-Sat, DVD player, CD player, hairdryer, washing machine and dryer. Garden furniture and BBQ. Baby bed and baby chair on request.